Rats, rats and more rats! Explore our printable rat activities below - you will find everything from rat writing paper and frames to a rat mask and a rat jigsaw, and lots more besides! This cute rat is missing his mouth, nose, feet and part of his ears! Complete the picture by copying the image on the right. Writing an acrostic poem about a RAT shouldn't be too difficult - although perhaps it is only one that you would think about writing at Chinese New Year, because the rat is rarely someone's favourite animal, and certainly not one to inspire poetry in the normal course of events! This little rat booklet is one of a complete set for the twelve animals of the Chinese Zodiac, and is of course particularly appropriate for children born in the Year of the Rat! You will need our origami booklet instructions. Let your child have fun copying this rat one square at a time. Here's the first of two fun printable jigsaws with rats as their theme - but I think you'll agree that this is a charming sort of rat! Just print, cut out using our jigsaw instructions and cutting guides, and cut. Print out this cute rat jigsaw for a fun little portable activity for the kids. Using our jigsaw instructions and cutting guides, choose an appropriate level for your children, and soon they will be putting this little fellow back together again! We love this cheeky rat lacing card - he's got such a lovely smile! Just print onto card, cut out and punch holes around the edges. Laminate it if you intend repeat use. 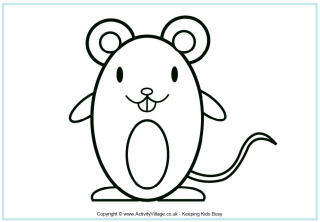 Print and cut out this cute rat onto some card, and punch holes around the edge to make your own rat lacing card. This quirky rat poster is sure to appeal to younger children! With bold outlines he also makes a good cutting out project. Or how about using the printable as a front page for a project on rats? We hope that this lovely rat story paper will spark off some good creative writing, and some lovely colouring in too! Two versions available, one lined and one with handwriting lines. 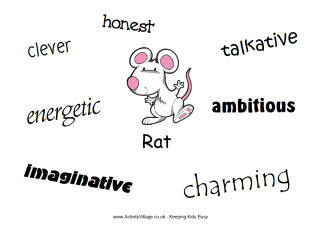 Use our rat writing page for creative writing or to collect together your research on rats. Designed primarily for classroom use, this printable is available in black and white or colour. This gorgeous rat writing paper is cute enough to encourage even the most reluctant writers to put pencil to paper! We have three versions available - framed, lined and with handwriting lines. 6 rat colouring pages in styles to suit all ages!